This is going to be your ultimate Korean food guide for your trip to South Korea. We will show you the some of the best Korean food there is! 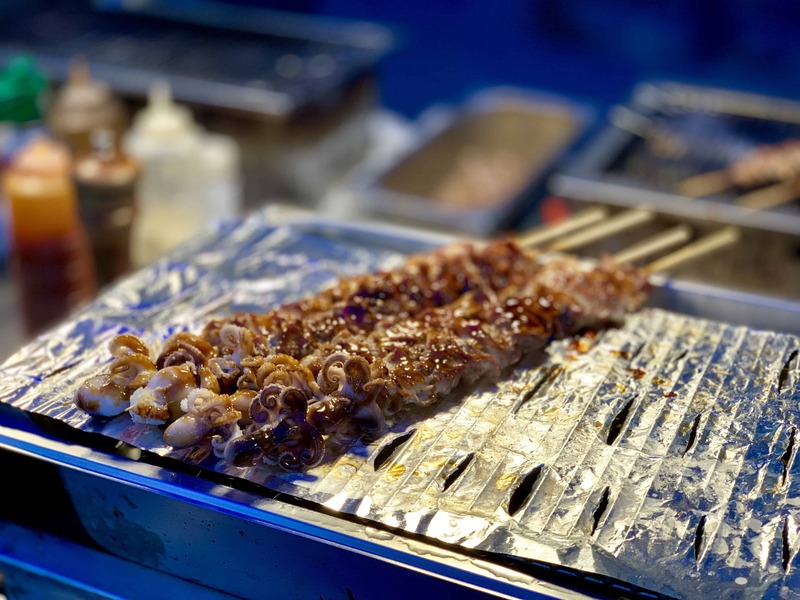 From traditional Korean dishes to Korean street food, and from Korean desserts to Korean kimchi, there will be something for everyone on this South Korean food list! 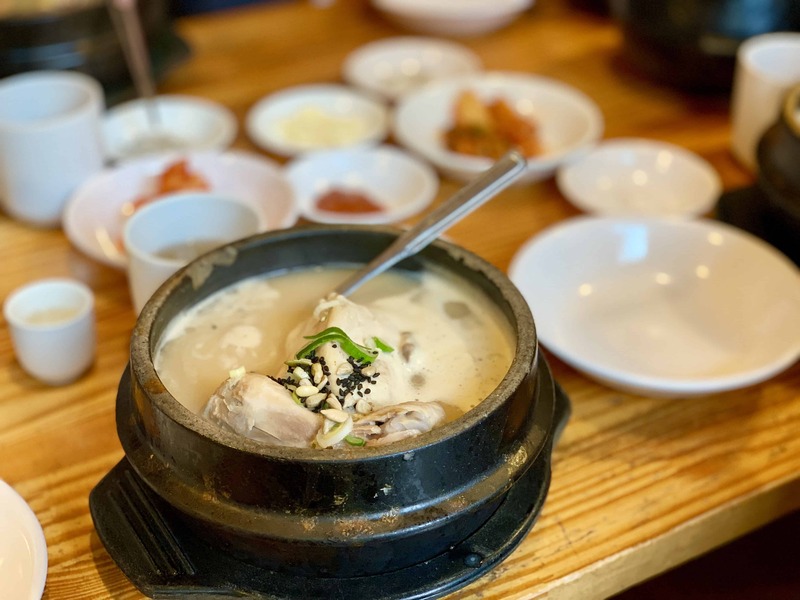 By the time you’re finished reading over these 25 foods that fall under Korean cuisine, you’ll be booking that flight on Korean Air ASAP! This is probably one the most popular Korean dishes. 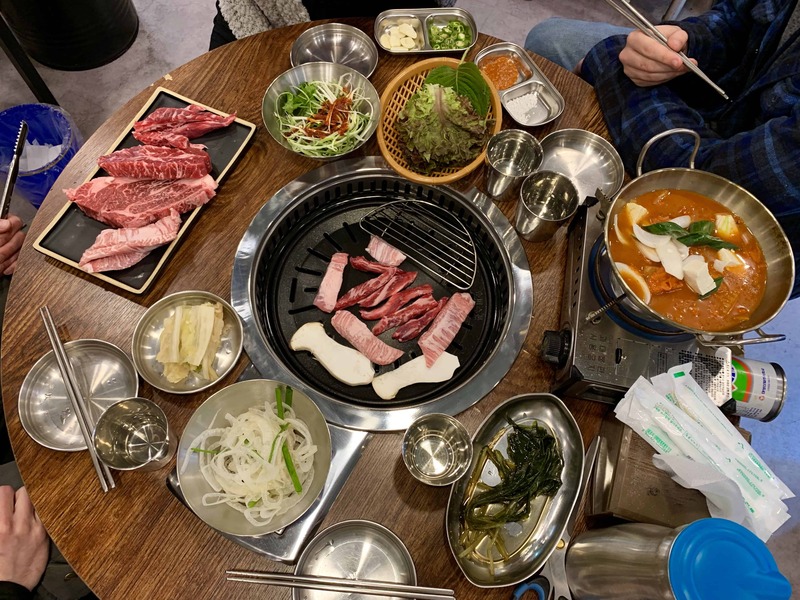 Every restaurant will claim to have the best Korean BBQ in Seoul, but most of these are so similar that you can’t go wrong wherever you end up. This isn’t just a meal, but an experience as well. You can choose from different meats, and you grill everything right there in front of you. We decided on the beef with one helping of pork. Surprisingly, I enjoyed the kimchi Korean BBQ soup that came with it! Kimchi, being a traditional Korean food, is served with most meals. Having it in soup form was a first for me, but I loved it! South Korea travel isn’t complete without experiencing this famous Korean food. When we looked up dessert restaurants in Seoul South Korea, we were surprised to find a Korean-based cake company. It wasn’t the standard food in South Korea that I expected. However, I’m a firm believer that a restaurant who specializes in one thing, normally produces a great product. Well, Billy Angel did that with cake. 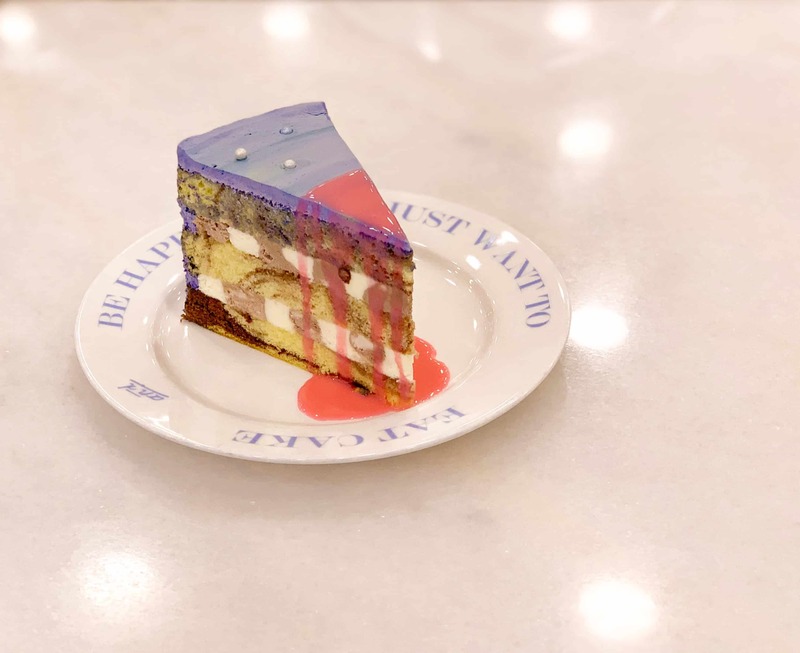 The restaurant is two levels with plenty of seating, and the cake did not disappoint. 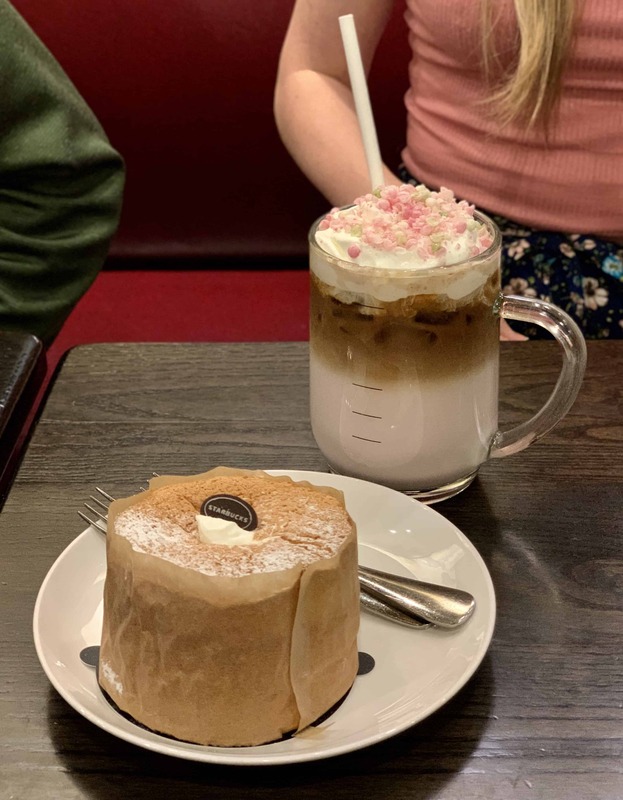 I had the galaxy cake, and I recommend it 100%! With ease, you can add this to your list of South Korean desserts you’d like to try! Helpful tip upfront: Get there EARLY! We were the first customers in, and by the time we got our food, the folks after us had an hour wait. It seems that this might be one of the best restaurants in Seoul! If you’re into “Instagrammable” places, well, then you’ll hit the jackpot here. The restaurant is gorgeous and the food is equally beautiful. Not only is it nice to look at, but it had many healthy options as well. After a long flight and fighting jet lag, it was nice to start the first day of our travels with something good, but light. After eating, you can get some of the best shopping in Seoul right next door at their cosmetics store! According to my husband, this might be home to the best food in Seoul. For a lot of folks, this is Seoul food. 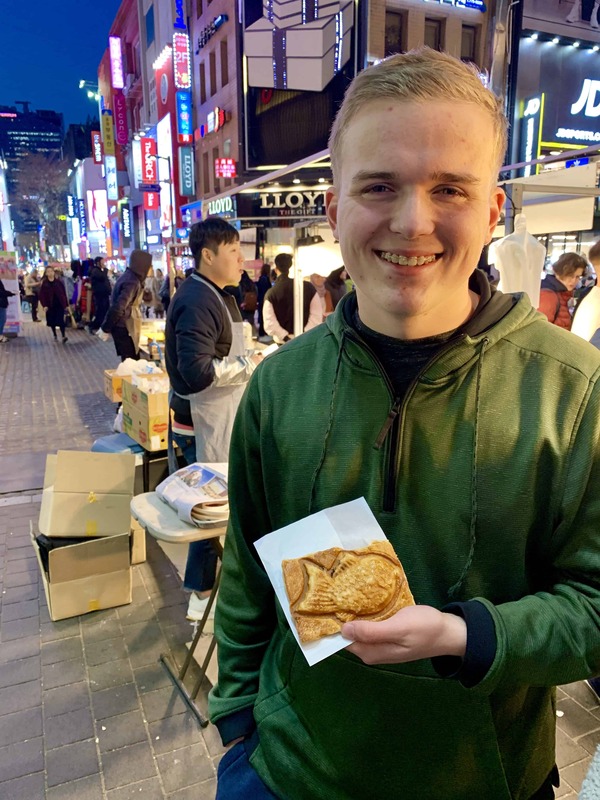 You can’t come to Seoul and not eat some dumplings! From the outside, you can watch them make their handmade dumplings from the window. So you know that the dumplings you are going to order are going to be freshly made. You know it’s going to be some good Korean food. 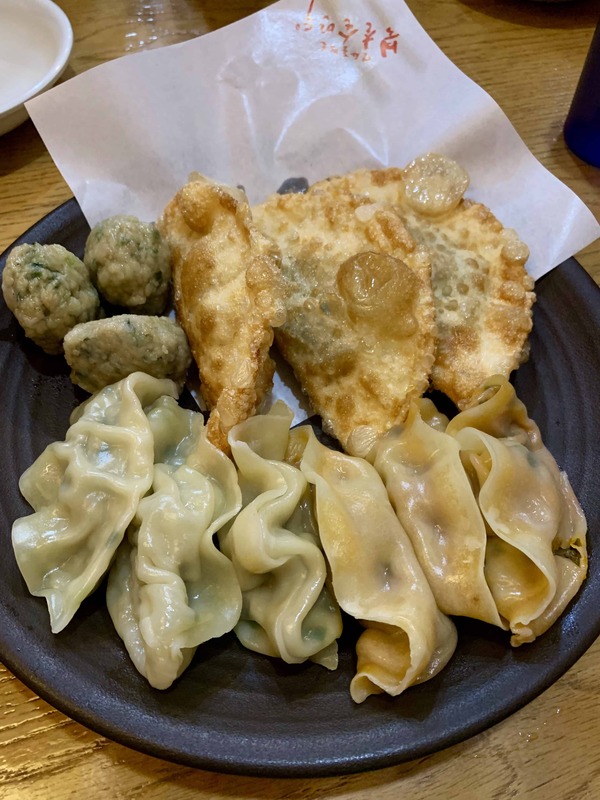 We ordered and sample plate with different dumplings, and I can attest…there was nothing leftover! Food, food, food. That’s what Myeongdon is all about! It’s a huge part of the Korean food culture. 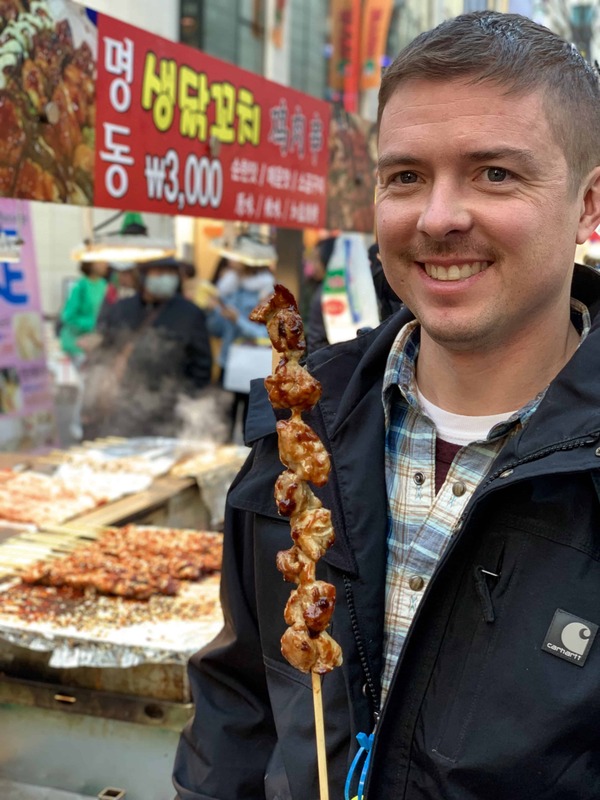 We tried so many local Seoul eats. Did you know that there’s a thing with Korean strawberries? Like, that they’re really sweet and well, pretty much perfect? You can find them along the streets of Myeongdong in different forms, but our favorite…candied! Yes, candied strawberries. They’re coated in the sugar shell, but they burst in your mouth. I can’t recommend these enough! Okay, we did not actually try this. Normally we try everything once, but no one was really on-board with the octopus. I will say though, folks were buying them left and right. We just couldn’t make ourselves do it. Maybe next time we’ll try this popular food in Seoul Korea. I mean, it is one of the top things to eat in Korea. 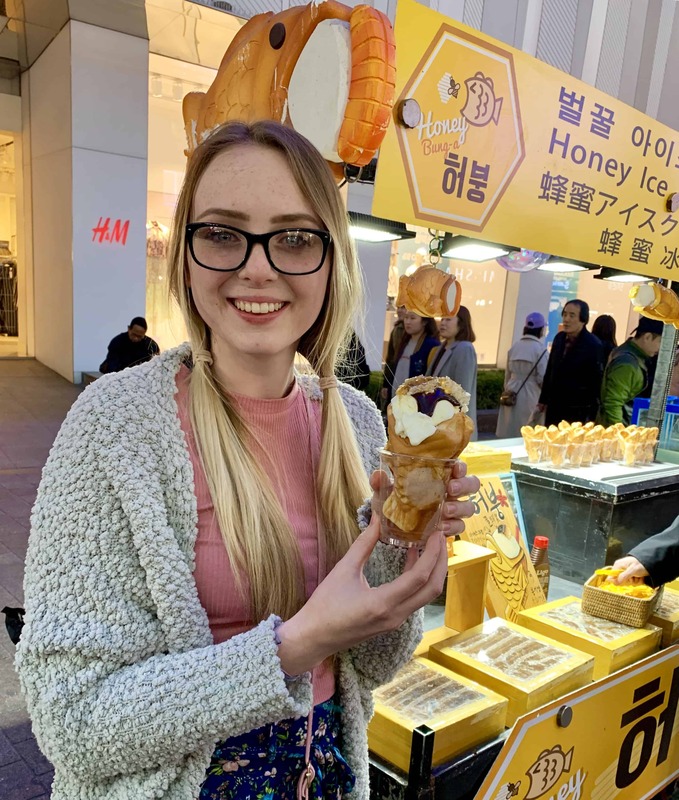 Please add the the following to Korean foods to try list: fresh and hot honeycomb ice cream. Y’all! We should’ve all gotten our own. So, the ice cream is placed in the sweet fish-shaped bread, topped with chocolate, but then…it’s topped with a piece of fresh honeycomb that is melted right there in front of you. I can’t even describe how good this was. This might even be a top food in Seoul for me. It’s up there! 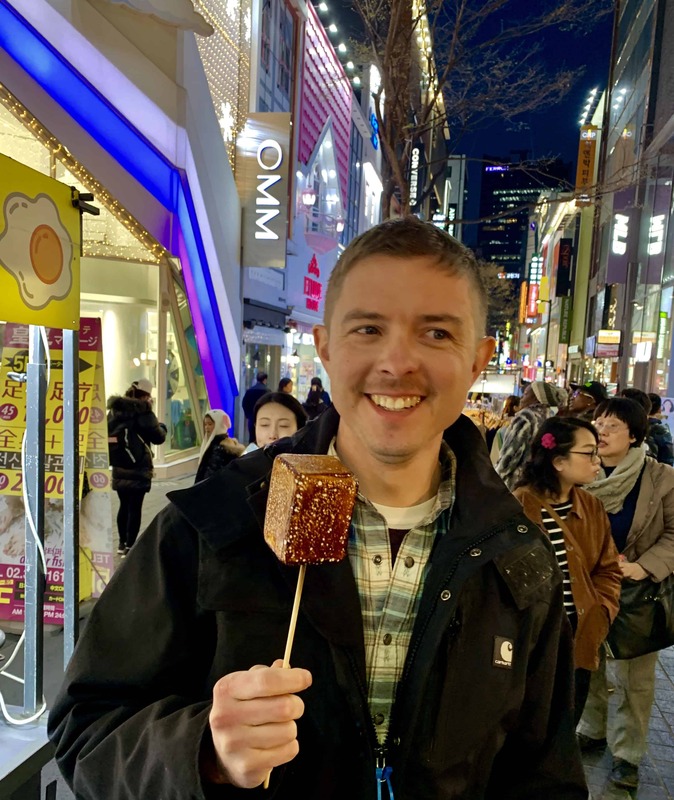 A top on the go food during your Seoul travel is meat on a stick. What can possibly go wrong here? Korean recipes using chicken, beef, or pork is already the epitome of Korean cooking. But then throw it on a stick?! That’s my kind of meal right there! 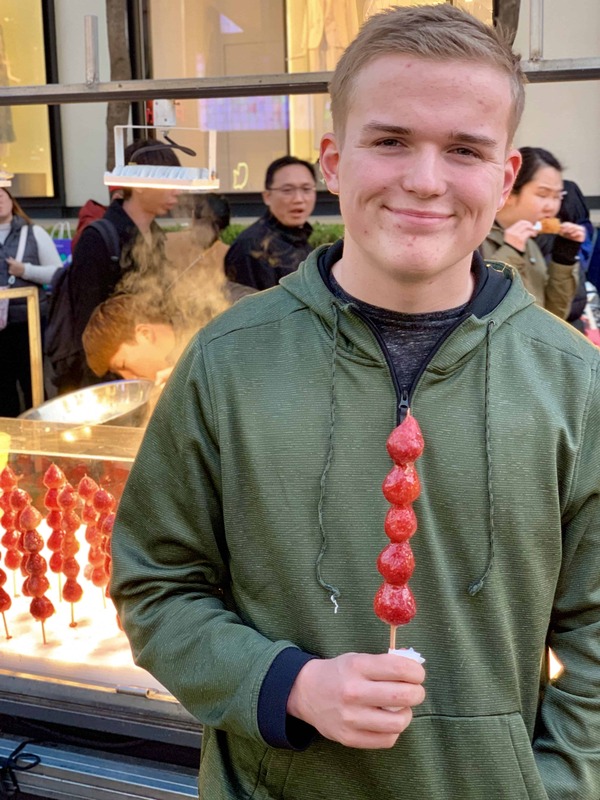 At any Seoul food market, you can find a variety of foods served on a stick, allowing you to eat while you search for the next thing you want to eat! 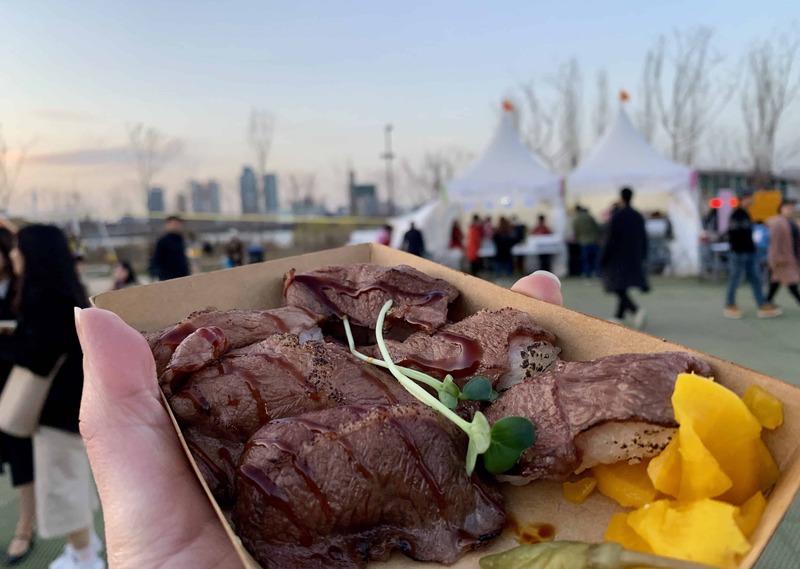 Can you tell that the Seoul food markets are one of the best places to eat in Seoul? You can find everything from savory to sweet here. If you’re ever on the platform known as Instagram, then you have probably seen these. 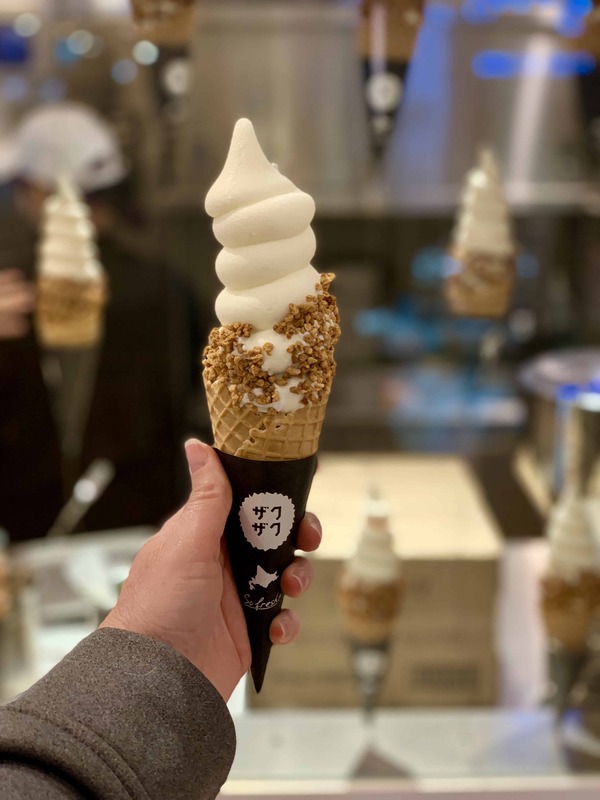 For just 2000 won you can get this ice cream cone that measures at 32cm! I got the strawberry, but didn’t love it. It tasted too artificial, but I would totally try the vanilla or chocolate next time. 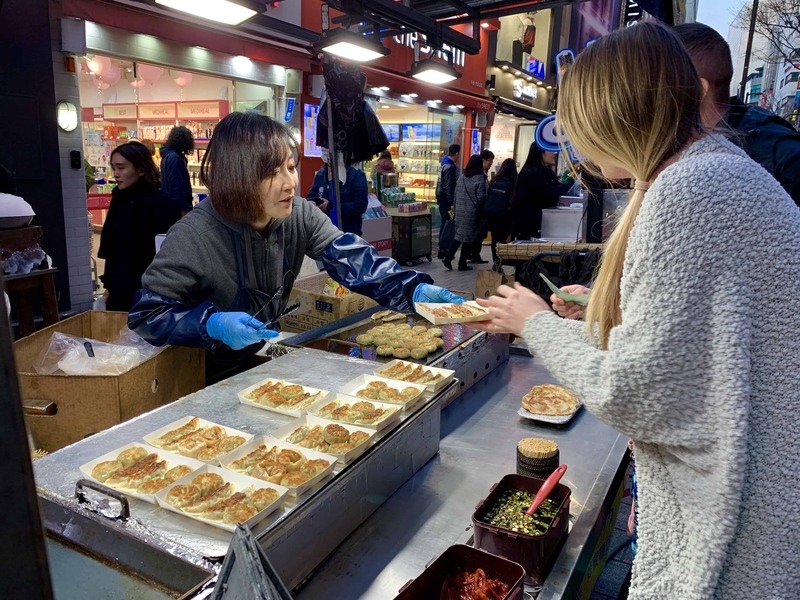 Bungeoppang is the famous Korean street food that you see pretty much everywhere you go. 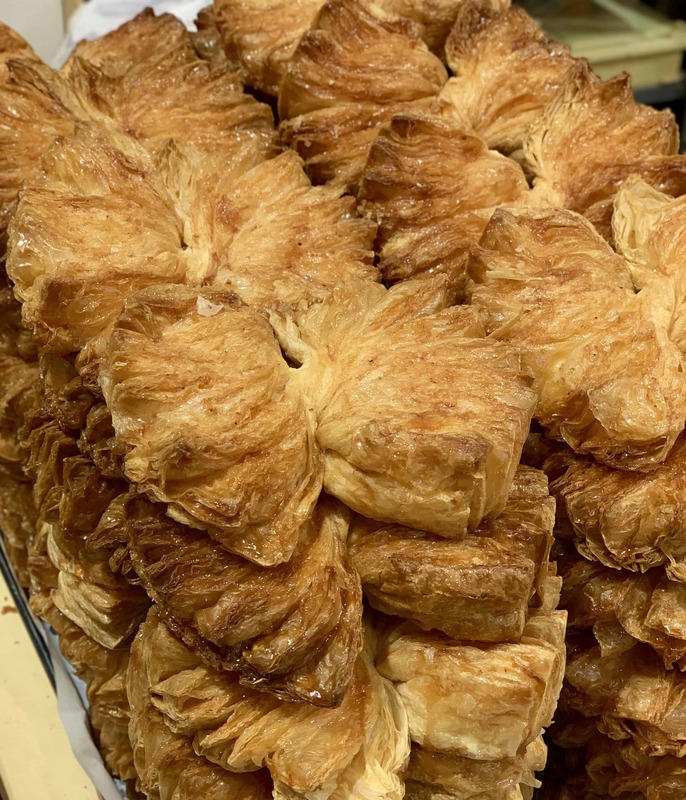 The sweet bread pastry is filled with a red bean paste or sometimes a custard of sorts. I’d say the red bean filled bungeoppang is one of the best Korean foods to try! Korea at night is covered with folks with one of these warm treats in their hands. 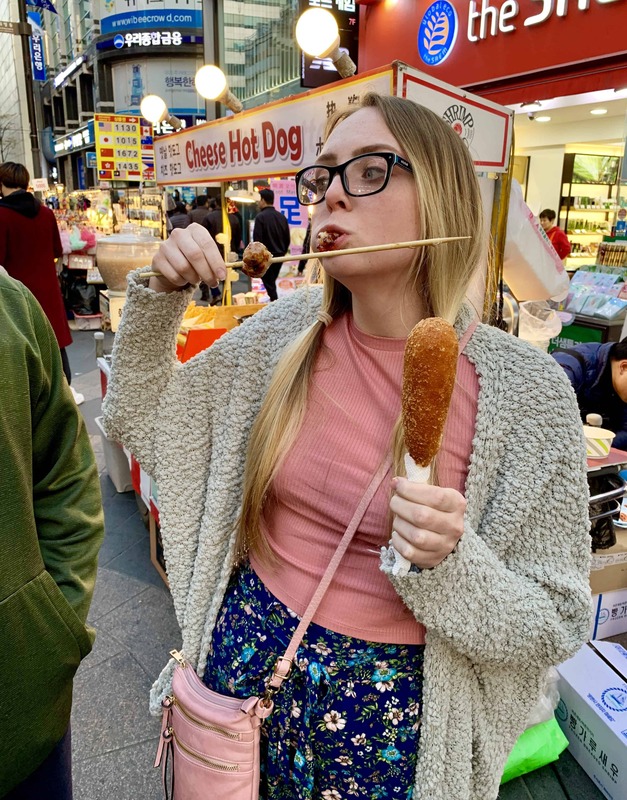 Below is how to look successful at a Korean night market. Food in both hands and in your mouth at the same time! The cheese hot dog is not what you might think. It’s actually half cheese stick and half corndog. They sell these throughout the day at various markets. 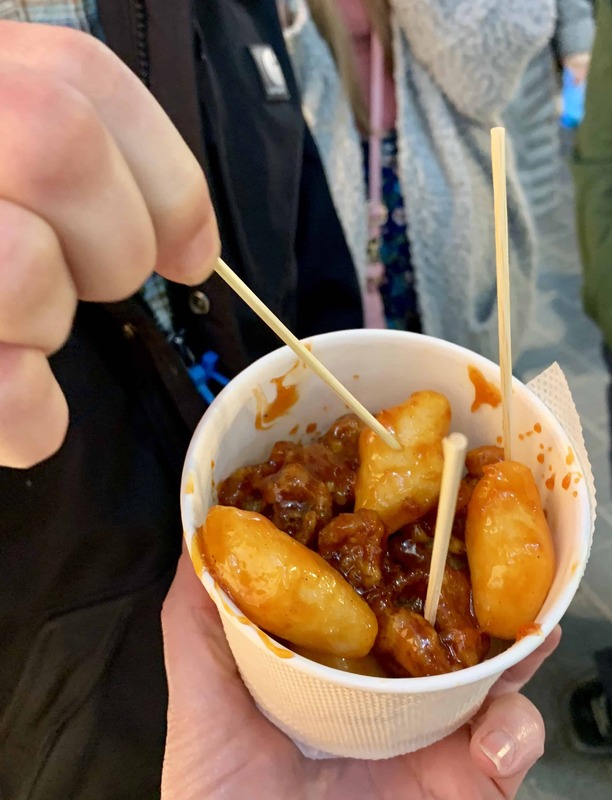 You just can’t go wrong eating South Korean street food! This bad boy right here was the most expensive thing we paid for during our Seoul food tour. It’s a frozen s’more. The graham cracker was the center filling surrounded by vanilla ice cream, and a coating of marshmallow and chocolate. The server then lit the entire thing on fire to smoke it and melt some of the marshmallow. Y’all. I wanted to take every single one of them home! They are to die for! It was worth the 8000 won. 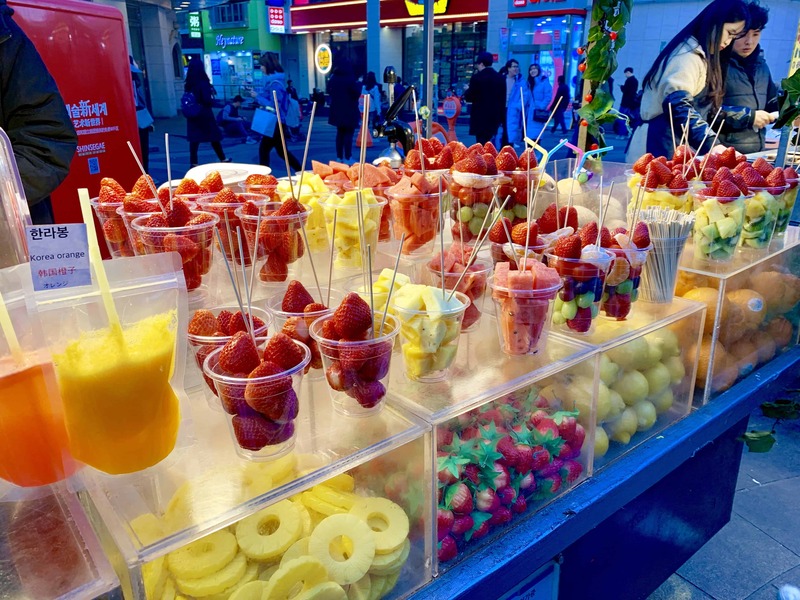 Most of the food from the Seoul night market is heavy and full of calories, but if you’re looking for a lighter option, check out the fruit stand. Not only can you get those strawberries we talked about earlier, but you can get other fruits as well. If you’re thirsty, grab some freshly made juices from this stand; we didn’t try any here, but we did try mango juice from a couple of restaurants and it was incredible! More dumplings! If I’m being honest here, I liked these dumplings better than the ones from the restaurant I shared earlier. My personal opinion of course, as Bryan liked the others better. Either way, you can’t go wrong. Korean food in Seoul, especially dumplings, is just going to be good. Period. Whether you’re enjoying them in a Seoul restaurant or on the Seoul streets, you’ll be pleased. We are Southerns, so when we heard that you must try Korean fried chicken, we were a little skeptical. However, we didn’t just get it once. We got it twice during our trip. The chicken is perfectly fried and it’s covered in the most flavorful sauce. My favorite part was actually the little pillows of dumpling dough. I could’ve just had a plate full of those. Located a little ways from one of the top Korea tour spots, Gyeongbokgung Palace, is a famous Seoul Korean restaurant. Tosokchon Samgyetang is known for it’s ginseng chicken and tourists and locals alike line up for the hour wait to eat here. Now, do I think it’s worth the hour wait? Um, no. Sorry Korea, but this might have been our least favorite dish. Plus, it’s a lot of work to eat…especially if you’re hungry. I’m not sure what makes this place so popular, as I saw the ginseng dish served everywhere in Seoul. 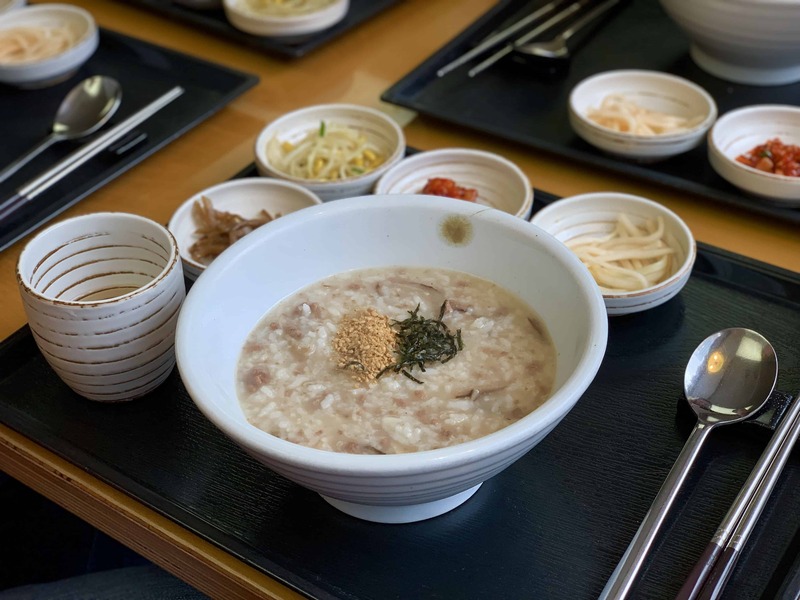 We weren’t sure what to expect when we found out that a popular breakfast in South Korea is savory porridge, but we had to try it for our food tour of Korea. We decided to visit Migabon since it was a short walk from our Airbnb in Seoul. Helpful hint: Migabon located on the second floor of the building. You don’t really know that from the outside unless you read Korean. Anyway, I was actually pleasantly surprised by this dish. It was very flavorful and it was extremely filling! We did a half day DMZ tour that day, so it was the perfect meal to fill up on before heading out. Another Korean surprise, but one I think you should try. I thought I was getting a creamy vanilla ice cream cone, but it was actually milk flavor. Now, don’t shy away too much. I’m not a milk drinking fan, but this wasn’t bad. I especially loved the little cereal bits on the side. Hindsight, I’d order the ice cream in a cup and have them pour the cereal bits on top. That way you can stir the cereal around in the ice cream. The Lotte Department Store Food Court does not disappoint! 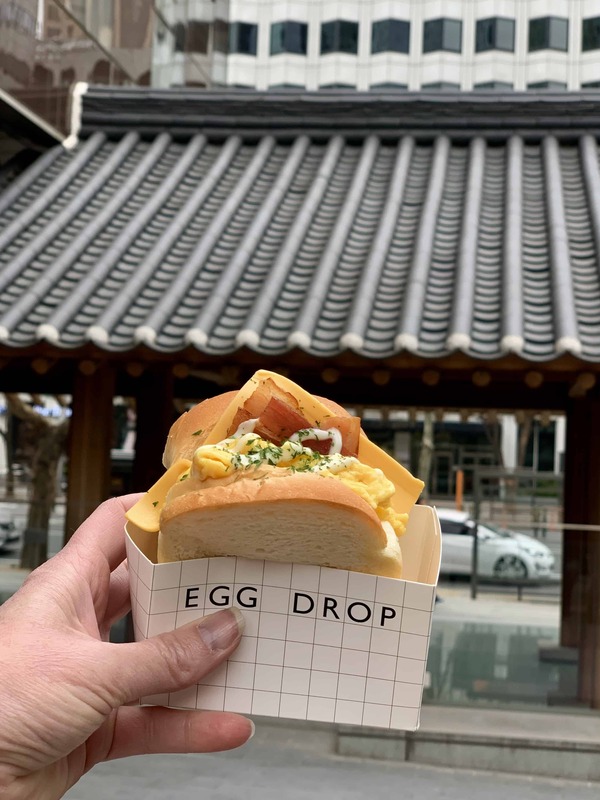 It’s not your average food court, and it’s worth adding to your what to do in Seoul Korea list. From conveyor belt sushi to French pastries, you’ll be sure to find something you can’t live without. Right around the corner from the food court is a grocery section. We had fun walking around looking at all the different foods…especially the fresh seafood. Oh…and they have a carton of strawberries that cost 25000 won, or almost $25! Isaac Toast is another “insta-famous” Seoul restaurant. 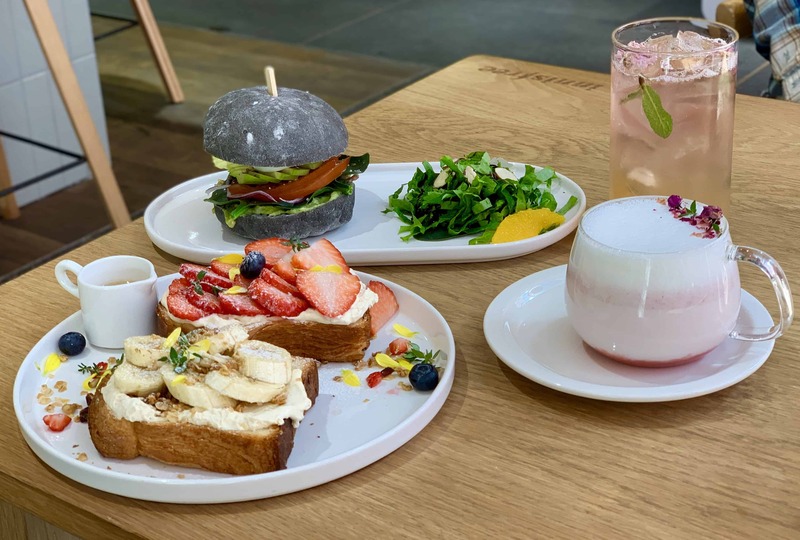 We were looking for a good breakfast before wandering around looking for cherry blossoms in Seoul, and decided to give it a try. First off, they have corn in their eggs…and it ain’t a bad thing! I actually liked it a lot. Secondly, they are an outward Christian based Korean company. It was cool to hear the same songs we hear in church playing, but being sung in Korean. If you’re looking for a substantial breakfast, I definitely recommend you work Isaac’s into your morning! Alright, I’m not going to lie. Egg Drop really let me down. I expected to be blown away by their sandwich, however, they gave us a breakfast sandwich on soft un-toasted bread. Since the bread wasn’t toasted, the cheese couldn’t melt. This left us with a semi-cold soft egg filled sandwich. Not appetizing at all. Also, they were suppose to open up at 10:00am, but we didn’t get served until closer to 10:30. So, based on our one visit here, I do not recommend them. However, a different location could have better service and offer a better dish. We visited the SOHO location. I am not kidding when I say this, but this might have been THE single best thing we ate while in Korea. 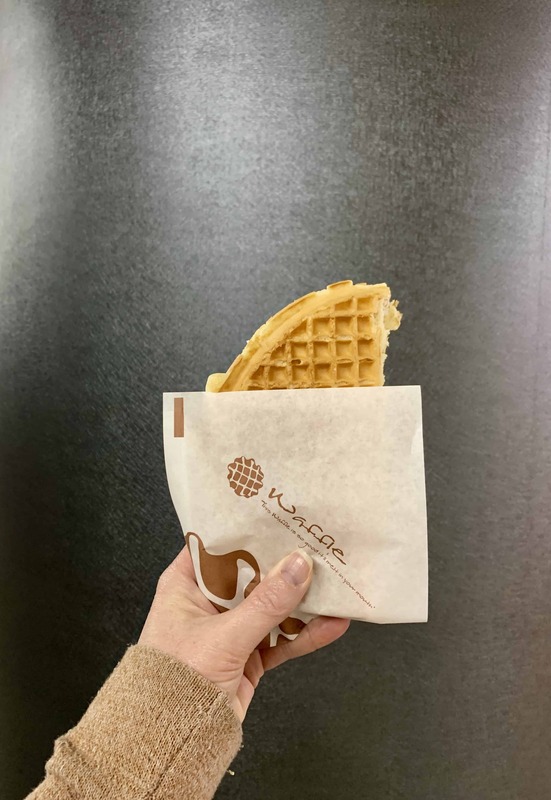 Out of all the places to eat in Seoul, the subway had this beautiful frosting and syrup filled warm waffle. Oh my goodness, I can taste it now. If you don’t have anything else we share on here, please do yourself a favor and have this waffle! It was 200 won when we were there, and well worth it! I think I could travel to Seoul Korea again just for this. As we attended a cherry blossom festival in Seoul, they had a number of food trucks. One of the trucks that caught our attention was the bulgogi and cheese stuffed bread truck. 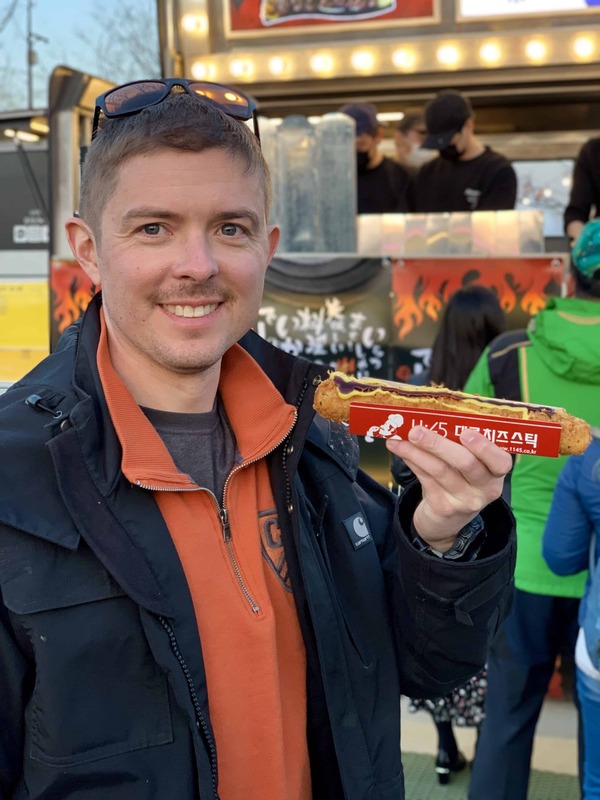 Again, think massive cheese stick, only someone with a killer bulgogi recipe decided to stuff it with their bulgogi too. We ordered two of these babies! I wish I had taken a picture of the food truck, so I could share who made these. Maybe while in town, stalk the food truck scene! Shoot. Another Korean food truck in Seoul that I didn’t get the name of. I’m so sorry. This truck was serving up some freaking bulgogi sushi. If you like sushi and bulgogi, then you’d be happy with this marriage of foods. Since we were trying different foods, we only ordered one of these, but I could’ve easily eaten the entire thing by myself. Some may judge us for being American and going to Starbucks while in Korea, but if you know us, you know we don’t care. Ha! 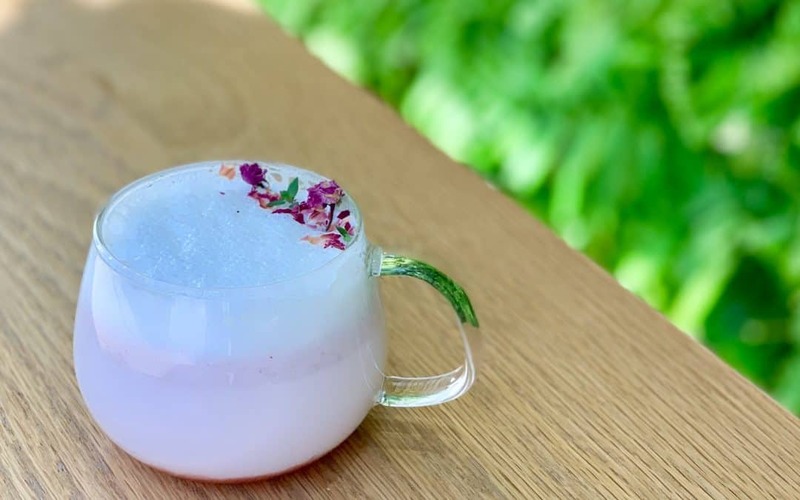 Plus, it was cherry blossom season in Seoul and they were serving up THE best cherry blossom lattes. They were so good that….get this, we went back every single day. Yep, we went to Starbucks every day while in Korea just to get the cherry blossom latte with an extra shot of espresso. The food was different there. After the waffle I mentioned earlier, this vanilla cake was the second best thing I ate in Korea. So, enjoy your Korean Starbucks visit and think of me when you have that cake! 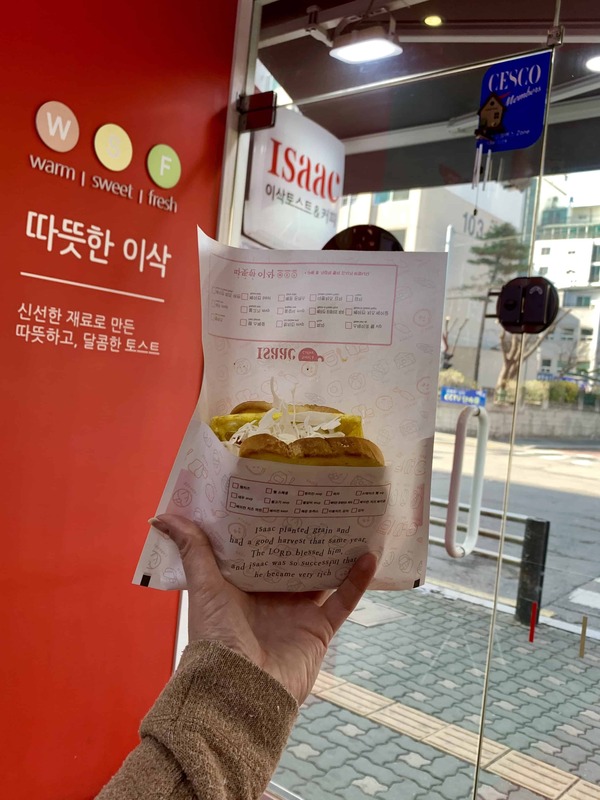 We hope that you have enjoyed reading about our Seoul food tour, and that you’ve made a list for yourself on all the things you want to try. 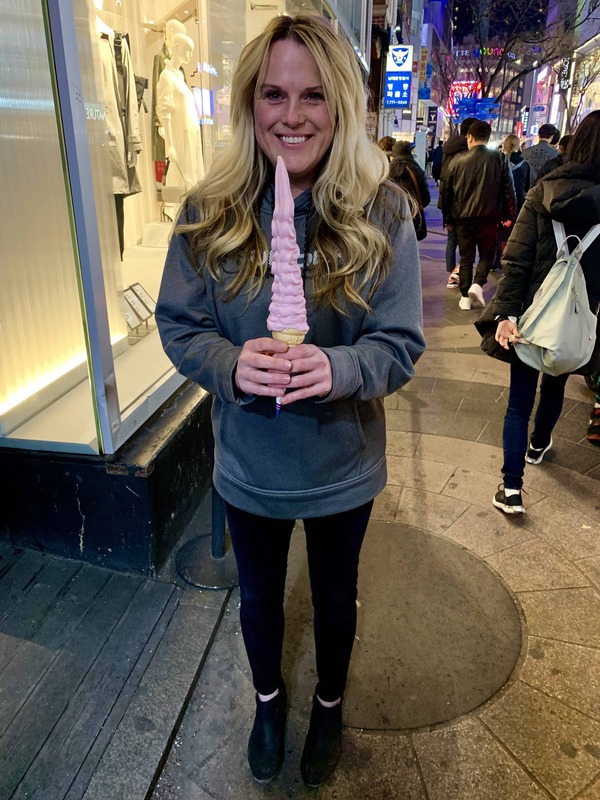 Seoul has so much to offer with things to do, where to stay, and as you can see, amazing things to eat! Now, if you don’t mind, I’m going to look up some Korean food recipes! Enjoy your trip to Seoul, South Korea!